So, the whales of West Cork are putting on a remarkable show this year. This is fantastic for Irish whale-watching enthusiasts. Traditionally, we would either have to hitch a ride with a scientific or fishing vessel travelling out into the middle of the Atlantic (still technically within Irish waters, but too far out to be any use to day trippers) or take off for one of the more reliable whale-watching sites around the world. 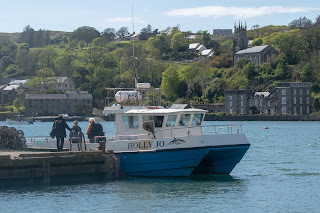 This year, though, you can book yourself on a boat with Cork Whale Watch out of Union Hall, sail past seals, shags, and gannets, and, just a couple of hours later, you can have a close and relatively undisturbed encounter with minke whales, humpback whales, fin whales, gannets, and hundreds upon hundreds of dolphins. You should definitely go. You would love it. As a veteran of many whale-watching adventures from New Zealand to the Azores, though, let me warn you about one other piece of fauna you'll probably encounter on your whale-watching trip: the Big-Lensed Camera Wielder. (Okay, they're really a person. You knew that.) This person definitely thinks that their bigger camera gives them a right to a better position on the boat than yours, even though they have paid exactly the same amount for their ticket as you paid. Two things particularly annoy me about this person. The first one is that they always, always want to be right at the bow, pressed against the rail, as close to the pointy bits of the boat as possible (I know heaps about boat terminology). And this is annoying because that's where the dolphins will show up to bow ride, and guess what the BL CW does not care about one bit? Dolphins. They are so over dolphins, they don't even ooh or aah when the dolphins jump out of the water in perfect synch, right beside their heads. Which is a pain for you, because obviously, like all right-thinking people, you love dolphins, and you want to watch them bow ride, because it is one of the greatest joys in all of life. The second, and most annoying, thing about the BL CW is that despite forcing you into what they consider an inferior spot on the boat, and making it clear throughout the outward journey that they have no intention of relinquishing their spot, they will absolutely expect you to move whenever necessary when the whales show up. Because, of course, the whales don't stay at the front of the boat, and the front of the boat doesn't stay still. And a good captain knows how to get everyone the best view possible. So the BL CW often discovers that when the action starts, what was a great position is no longer a great position, and suddenly there's a humpback breaching off the stern where everyone happens to be throwing up. And they will one hundred percent try to get past your face and your phone camera with their huge lens, and they will expect you to be fine with that, because do you not see how expensive their equipment is? You can let them or not. But don't be intimidated by them. Once again, you paid just as much for your ticket as they did. Also remember to wear warm clothes, a hat, and plenty of sunblock. Enjoy the whales. Don't be put off by the fact that their abundance is almost certainly a sign of some terrible impending disaster. This is a solidly good, exciting, only-as-brutal-as-it-needs-to-be adventure story set in Martinique and Grenada in the late 1700s. Based on a true story, it concerns two slaves who are sent by their master - a French friar - to steal another group of slaves from Grenada and bring the group to Martinique. The book certainly doesn't gloss over the reality of slavery in the Caribbean, but it is definitely an adventure story first. And, like many of the best historical novels, it has made me add a couple of nonfiction books to my reading pile, just to find out more about the period it discusses. I'm just going to park this list here, and hope that Nicole does not think better of it and delete the whole thing. Last year, more or less on a whim, I entered the Irish Writers Centre Novel Fair. I was about halfway through writing a book I thought was properly good, and was certainly topical, and I wanted a deadline to give myself the push to finish it. So, I paid over my €50 as soon as the Novel Fair opened, then spent the period between April and October getting my first 10,000 words into as good a shape as I could get them. I paid an editor to polish my entry (missus). This was extremely valuable for a whole lot of reasons. Obviously, the main one is that a good editor lifts your writing from readable to really pretty good. Another is this: did you know that you don't have to make every change the editor tells you? After twenty years in the tech writing business, hewing closely to the style guide at all times and bowing to the superior knowledge of my editor/SME, I found it very freeing to realise that if the editor wanted to swap "handsomeness" for "good looks", I could refuse to make the change. I got a synopsis written. This is horrible, and everyone hates it, and somehow it's much harder than writing the whole actual book, but I got it done. And, hey, I must have done something right, because I was shortlisted. I got my novel finished, edited, beta-read, and re-edited. And people who read it liked it. I met the other writers. We flapped about how worried we were. We discussed bindings and bulldog clips and Strepsils. So much excitement and validation and fluttery nerves and camaraderie. The day itself was a lot of fun, too. Obviously it did not go as well as I would have liked, but that's alright. It did go very well for other people. But, you know, Jacob turns the wheel, or whatever. A few years ago, I read an interview in the AV Club with a blogger who had been a contestant on The Biggest Loser. She talked about the close connection all the contestants end up having with the trainers, and how it all gets very intense, and the trainers promise they'll keep in touch when contestants leave and the season finishes. But, this person said, you rapidly discover that the connection, as deep as it might have been, is temporary. Eventually, even the neediest former contestants get the hint that they had their turn, and they have to get out of the way and let someone else have their turn. The 2018 Irish Writers Centre Novel Fair opens for applications soon, and in another ten months or so, there'll be a new crop of writers getting the phone call. Maybe they'll actually be expecting it. I hope it makes them as happy as it made me.